Tips Tuesday – Layering Transparants | Flaming Hot! We all know about encasing. Enclosing a base of glass with clear glass. It gives depth and magnification to designs. Think of a glass paperweight. It’s like magic.And we all know about layering a transparent color over an opaque color to get more depth in our color or to create new colors altogether. But, how often do you layer transparent colors to create new colors? That is one of my favorite things to do. Why? Because I get colors that have way more depth and character and it makes my beads different from everyone else that is going straight from the rod. Shown here are some experiments with Effetre glass. It doesn’t look like your typical Effetre, does it? There is some enamel swirled in there too. Sometimes you get really good results, sometimes you don’t. But every experiment helps you to learn something about the color characteristics of your glass. So, even failed experiments are beneficial. 1. To start with, stay in the same color family. Since color families are most likely made with the same metals to get the color, chances are you won’t have a bad reaction that turns your glass to mud and you will have better success. 2. Work small and let them cool in a fiber blanket or on your workbench. You will see your results faster that way. 3. 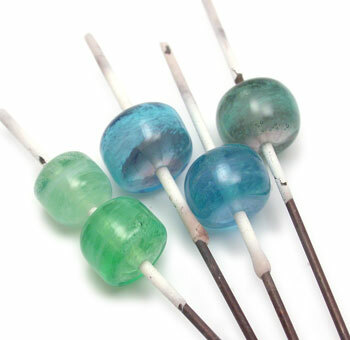 Make more than one bead on a mandrel. Put down three bases of the same color and encase each with a different color. You get three samples right there! 4. If you set aside crooked or shorter mandrels when working (or those that have a chip out of the bead release) use them for this type of experimenting. 5. Write down, right then and there, what colors you used. You can get going with so many examples that you lose track. If you work small enough and use a fiber blanket, your examples won’t crack (at least not right away)…take a pictures and print them with the color formula next to it. 6. Try spot encasing. Don’t fully cover the base with the top color. For the most part, the color you use for the base will show stronger than the color you put on the top. Oranges, reds and cobalt blue throw this all out of whack because they’re really saturated colors. « Get it Done – Blog It!